ROSEMONT, Ill., March 20, 2018 /PRNewswire/ -- Corelle Brands, the newly-named parent company behind beloved housewares brands such as Pyrex®, Corelle®, CorningWare®, Snapware® and Chicago Cutlery®, received the highest accolade as Global Honoree of the IHA Global Innovation Awards (GIA) for booth design at the International Home + Housewares Show in Chicago this past weekend. This award comes after the company recently changed its name from World Kitchen to Corelle Brands, reinforcing the company's commitment to its iconic brands and focus on future growth. Corelle Brands captivated attendees at the show with its integrated booth, which was designed as a serene and welcoming space within the busy environment of the show. Under a soaring white peaked-roof, attendees were welcomed into a home-like structure that moved them from a comfortable seating area in the "entry way" through the "main room," featuring armoires filled with 2018 products and two 12-foot-long tables that beautifully highlighted Corelle's latest lifestyle collections. Past the tables, visitors were greeted by a bright kitchen area, showcasing a perfectly organized pantry and kitchen. "With our new company name and vision, we wanted to create a fresh, welcoming space to highlight the design and functionality of our new products, while introducing a new face of Corelle Brands to the housewares industry," said Patrice Varni, Chief Customer Officer at Corelle Brands Holdings Inc. "We're thrilled to be honored by IHA Global Innovation Awards for the Corelle Brands booth design." 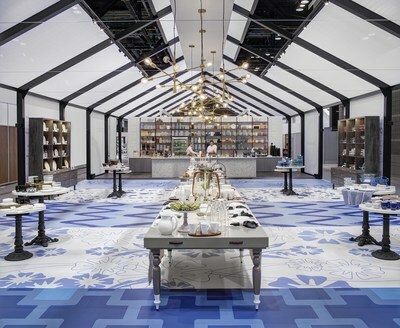 Decorated with subtle nods to some of its well-known housewares brands, the space featured Corelle patterns printed on the floors, chairs hand-painted with CorningWare's iconic blue Cornflower pattern, and tablescapes displaying more than 25 different Corelle patterns. Ashton Keefe, a Manhattan-based chef and food stylist, was also in the kitchen, showcasing for attendees how to best cook, plate, and serve in the newest Corelle Brands product offerings through live on-site food demonstrations. The Excellence in Booth Design Award is recognized as part of the IHA Global Innovation Awards for the first-time this year. Honoring exhibitors that have shown creativity in design, merchandising and messaging, booths are judged by a distinguished panel of visual merchandising experts on several criteria, including: lighting, prop use, background, colors/textures, graphics, display fixtures, product placement, cohesive presentation, and general presentation. The booth was designed and visually merchandised by New York-based Dash Design in collaboration with Lonsdale of Paris, and installed by Chicago-based Czarnowski Exhibit and Event Marketing. To learn more about Corelle Brands, visit www.corellebrands.com. Headquartered in Rosemont, Ill., Corelle Brands LLC (the US operating subsidiary of Corelle Brands Holdings Inc.) and its affiliates manufacture and market products worldwide through a portfolio of well-recognized and respected brands, including under the Pyrex®, Corelle®, CorningWare®, Snapware®, Chicago Cutlery®, and Olfa® trademarks. Corelle Brands and its affiliates employ approximately 3,000 people and have major manufacturing and distribution operations in North America and Asia-Pacific regions.